Just the sound of the term bathtub surround invokes comfort and grace. Polished or honed, the elegance of a natural stone tub surround can turn any bathroom into an oasis, a getaway from everyday stress. Who wouldn’t love melting into a warm bath enveloped in an onyx tub surround? And pairing an onyx tub surround with an onyx vanity top and black fixtures would create a classic, chic look that offers physical and mental pleasure for a lifetime. Trendsetting homeowners and designers have a new love for the seamless, clean lines of natural stone bathtub surrounds, as they steer away from the structured expression of tile, whether that’s natural stone tile, porcelain or ceramic. Natural stone surrounds offer more than just aesthetics and eye candy for the soul. The use of natural stone means installing a fixture in the home that could last a lifetime. The durability of natural stone makes it the perfect fit for any bathroom. Plus, regardless of what natural stone is the choice for the tub surround—onyx, travertine, marble or granite—all slabs are unique, making every bathtub surround an original. Customers of SlabMarket members can find a variety of natural stone options for local slab yard. Containers should be filled with slabs representing an array of natural stones from which to choose. You customers will enjoy being able to see all the stones in your yard for all of their installation needs. While porcelain and ceramic tile can be less expensive in the short run, natural stone surrounds are designed for the long haul. And while natural stone tiles are an alternative, all tile requires grout, which is a major reason natural stone surrounds are gaining popularity. The inevitable constant cleaning, maintenance and replacing of grout has many homeowners wishing they chose a granite tub surround or onyx tub surround instead. Grout will always be susceptible to mildew stains and discoloring over time. Grout by its very nature is quite porous, allowing moisture and bacteria to penetrate and grow. Eliminating grout eliminates a host of problems and worries. Indeed, natural stone surrounds require caulking during installation, but there are fewer seams to worry about than tile. Installing large sections of natural stone for a bathtub surround also protects the walls, and helps tie the entire room together. A natural stone surround offers a leak proof, solid base that requires minimal care. Consider a polished granite tub surround, which will prove less absorbent than a honed granite slab. 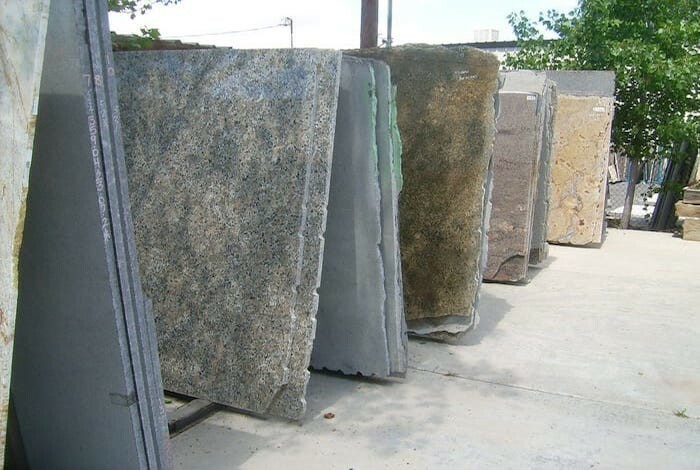 Granite colors available from the natural some industry are so diverse, whatever your style, a slab yard has the answer. Love green? You’re in luck. Looking for a multitude of specks and flecks? No problem. The variety of stone colors offered at slab yards allow for endless possibilities to mix and match vanities, floors and fixtures. Customers like a variety of stone colors for tub surrounds from which to choose, so slab yard containers should be filled with diverse options to match the different styles and needs of consumers. The natural stone industry reminds homeowners and designers that marble, onyx and travertine bathtub surrounds can be more porous than granite and will require regular sealing of up to four times per year. For granite, we recommend sealing once or twice annually. 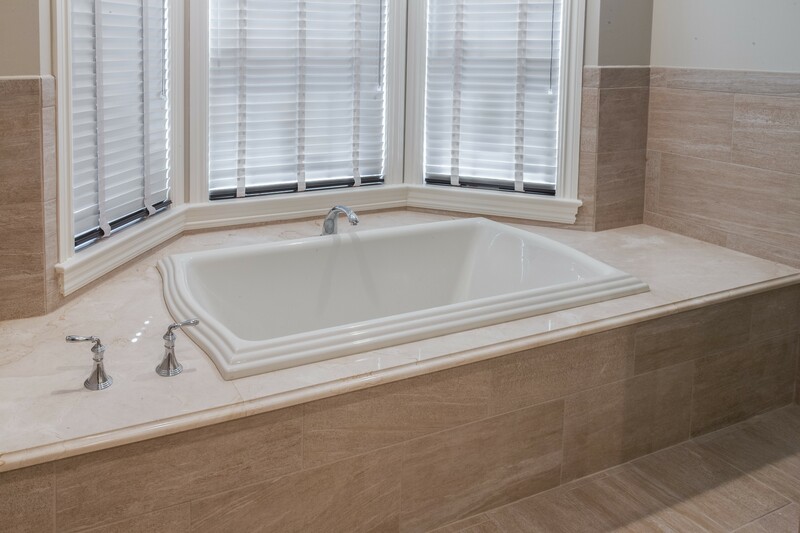 But don’t be afraid to consider a travertine tub surround; although a porous natural stone, travertine is at home in a wet climate—it is born from the water. Travertine tub surrounds offer a laid-back soothing appeal, perfect for becoming one with nature. Natural stone is attractive, durable, and the multitude of stone colors of which SlabMarket members fill their containers allow for the creation of any design and style.